I have just not been able to tackle this until now. This idea first took form just over a year ago, these “why I love” pieces. They are for my Top 50 Simple Minds songs, and I was going to write one a day for 50 days. I quickly realised that was a bit much, especially as about…14 days into its conception, I went to Australia. Any spare time I had I then started working on the art. The time it took to think about what song I was going to write about and the reasons for the “love” became a little more complex for me. I found it hard to be in the headspace I needed to achieve what I wanted with these. The aim was always to do Wonderful In Young Life last as, at the time of conception, it was my No 1 Minds song. It still is, really. But it jostles at the top with Boys From Brazil which I have already written about. So, yes…the aim was to write about it last, but then I didn’t worry about that so much. The big worry was HOW was I going to express how I feel about this song? Let me tell you, to begin with, when I first heard this song, I WAS IN TEARS. I just found it so astoundingly beautiful. Jim’s lyrics just hit me like a freight train! It was that celebration of youthfulness, friendship and adventure. I never really experienced those things in my late teens and early 20s. I left school very young. I was bullied through most of my school years and missed A LOT of schooling. A lot. In one year, I was known for having been absent from school for 114 days. As if I hadn’t been bullied and scared enough…I was now being scolded and derided for having so much time off school. Oh, the irony! It continued into high school. How painful it was for me to WANT TO LEARN, to get an education (I have spent so much of my adult life on a quest for self-improvement and knowledge) and be denied it by feeling helpless and weak against constant bullying. As a result, I left high school in my second year, aged 14 years and 10 months. That is the youngest you could legally leave high school, and I had to get special dispensation from the New South Wales Education Department to do so. As a result of this, I made and had few friends. One of my prime bullies lived in the same street. I couldn’t escape her. But she kept her most vindictive bullying for school. So I stayed away from school, and I would keep myself indoors. One day I was out playing with one of the few friends I had in my street, and Leonie (yes, you never forget a bully’s name. I can’t name too many other people I went to school with…if indeed you can call it that, seeing I was there so little) made one of her usual bullying remarks. I can’t remember what she said now…but I had had enough. The bullying by this point, must have been going for…2 years, at least. It was the straw that broke the camel’s back. I was riding my bike when she made her remark. I remember getting on the pavement (we lived on a quiet street and I would ride on the road), throwing my bike down (I LOVED my bike, I was angry!) and walking over to her SSOO angry I was crying. I knew what I was about to do went against everything in my nature, but I had just had enough. I wasn’t scared, really. I was just SSOO angry with her that she had forced me to do what I was about to do. I punched her. I then collected my bike and walked home (literally 20 yards away), crying uncontrollably. I cried and cried. Mum tried to comfort. “It wasn’t your fault. I can’t believe it took you this long. Don’t feel bad! She deserved it!” But it didn’t stop me feeling like the worst person in the world. There was nothing positive about it. I felt awful. I had hurt another human being and I didn’t feel vindicated in the slightest. Of course, as it is in countless books and films, etc…she then had respect for me, and we even became friends, of a sort. I have the residing memory of watching an appalling pirate copy of E.T. The Extra Terrestrial on VHS at her house. It was at the cinema at the time, and we were watching one of those pirated by recording from the cinema screen copies. It felt very naughty! Leonie and her family moved away from Ayrshire Street…I moved on to high school, and the bullying started all over again. This time though, it was boys. Really not something I felt equipped to combat in ANY way, shape or form. Again, I remember my bullies names. They are etched! Tim and his mate Mark. I saw the school counsellor about this one. I even had a mediation meeting with Tim. Yeah, that stopped the bullying! (not) The counsellor was convinced the bullying stemmed from Tim actually being INFATUATED with me. Well, that was the most absurd thing I had heard in my life! I moved high schools the following year…then eventually the reason why I left my previous high school became known…and, you guessed it! So, friends I had in the street moved away. Friends I had in high school I lost contact with because I was no longer there. Like I said when I made the Bowie art piece for “What In The World” – I *was* that “little girl with grey eyes” deep in my room. Music became my companion. I didn’t want to know people or make friends. I wanted a boyfriend! But I would just crush on older guys because they were “safe” (ie: not interested in me). By the age of 16, I had two friends…my mum and my neighbour Annette who was older than me by several years, partnered and already had 3 children and a forth soon on the way. She came from a big Catholic family of 12 children. And this story could go on…and get FAAAR removed from its point. It has so wildly digressed already. But, getting back to it…this is why Wonderful In Young Life had such an impact on me in the first listen. It made me mourn for things I never felt I properly had. Heading off on adventures, meeting up with friends, feeling you had your whole life ahead of you and it was going to be fabulous. And that’s why it would make me cry so much in the early days when I would play it. I adored it (still do!). It was celebratory and glorious. Life sounded beautiful, fun, exciting. Full of hope and future and dreams! And silly things too. Seeing images in my head of a young, beautiful Jim and imagining having HIM as a boyfriend and feeling forlorn I was half a world away and 11 years younger at the time the song came out (well, I’ll always be 11 years younger than him, but you get what I mean! Lol). And this is what stopped me from trying to explain what the song means to me, because for a long time, as much as I love it and adore it, it would upset me. It’s probably only in the past 3 months that I now feel fully joyous to hear it. Fully celebratory. That I can enjoy that full glory of the song without feeling regret or forlorn or like my aspect of the kind of life Jim described in his lyrics was snatched from me. I don’t feel that now. I hear pure joy, pure love. It is just SUCH a celebration of life. Not necessarily young life…but it focuses on it, no doubt. I don’t know how he does it…or did it. How he conjures up such beautiful words and imagery. Before I go on…let’s talk about the musicality of the song. That drum beat at the start. I will forever love Brian McGee as a drummer. Charlie’s guitar just wails everywhere. It SOARS! And, Derek’s bass…just manic and amazing. But back to beautiful Jim and those beautiful lyrics. Maybe it was this song that made me fall in love with him? Oh…it’s a cornucopia of things! But his ability as a lyricist…his way with words, it is a very strong factor! He talks of youth with maturity and that belies his tender years. It’s a song that should have been written by someone already into their 30s, at least. There is so much strong imagery. Sunny, warm days. Cloudless skies. “Crowded swallow skies” – it’s late spring or early summer…warm, sunny, beautiful. You’re with your friends, looking around a beautiful city…Rome…Barcelona…Prague…it could even be Sydney (we have our own version of swallows out there, and whenever I saw them flying about when I was out there this last time, it always conjured up this song), seeing all beautiful things, being one of those beautiful “wild girls” with your “little Egypt eyes”…seeing “angels coming your way”. And the way he sings. Those falsetto notes! 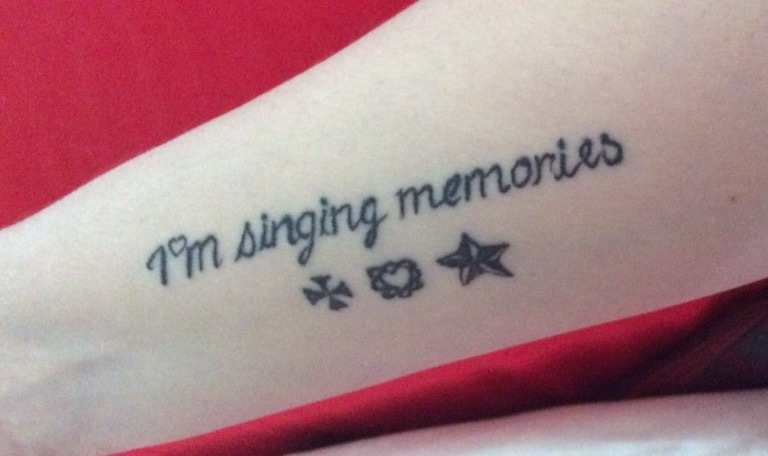 And that is why I have my “I’m singing memories” tattoo, because of the meaning of the line…when I go to a Simple Minds gig I am indeed “singing memories”, and because of Jim’s beautiful falsetto notes. That would be the thing that would tip me over when listening to the song and have me crying. It’s divinity in a Simple Minds song for me. One angel that came my way was this song. For all the times this song has made me cry, I am thankful. Because although it would initially make me feel mournful for something I never had, it also fills me with a joy that very few other songs truly achieve. Not on this kind of level. And that is why I love…Wonderful In Young Life. This entry was posted in discussion, interactions, music, personal, video and tagged my Top 50, simple minds, why i love, wonderful in young life. Bookmark the permalink. Yes…I really, REALLY want that soundwave tattoo. Really enjoyed reading that. Very moving and you write very well and from the heart.